uRepeat the procedure to select Clock, then Clock Adjustment. 1. 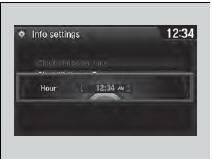 Press and hold the CLOCK (SETTINGS) button until the clock display blinks. 2. 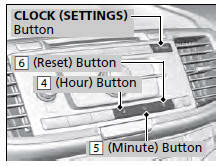 Press Preset (4 (Hour) or (5 (Minute) to adjust the time. 3. Press the CLOCK button again to set the time. To set the time to the nearest hour: Press and hold the CLOCK button until the clock display blinks, then press the (6) (Reset) button. 3. Adjust the hours and minutes by selecting . 4. Select 12H or 24H. 5. Press Set to set the time.